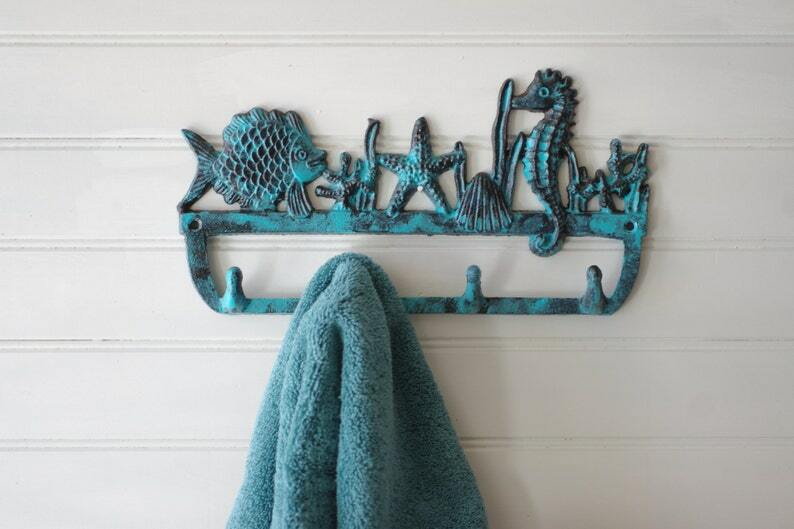 If you love sea horses, starfish and fish, you're going to love this lovely nautical coral reef hook. Perfect for your indoor or outdoor shower area for towels, use it as a key hook, or even to hang your jewelry on. It would also look perfect in a nautical themed kitchen. We've painted this piece aribbean and sealed it with a protective sealant. It was lightly distressed to show all the details. It's literally an underway seascape with four hooks, coral, a sea horse, a fish and a starfish. Get this piece distressed (as shown) or painted solid (no distressing). Shown here in Caribbean / distressed. Also available in any of our 20+ colors. Easy to mount with two screws (supplied). Very well made and accurately described!